Fruit Chan is the Hong Kong director best known in the UK for his independent film classic Made in Hong Kong (HK 1997) and his horror features and portmanteau film episodes such as Dumplings (HK 2004). His latest venture proved a suitably bonkers but enjoyable finale to the Asia Triennial 14 Festival screenings programme at Cornerhouse, Manchester. 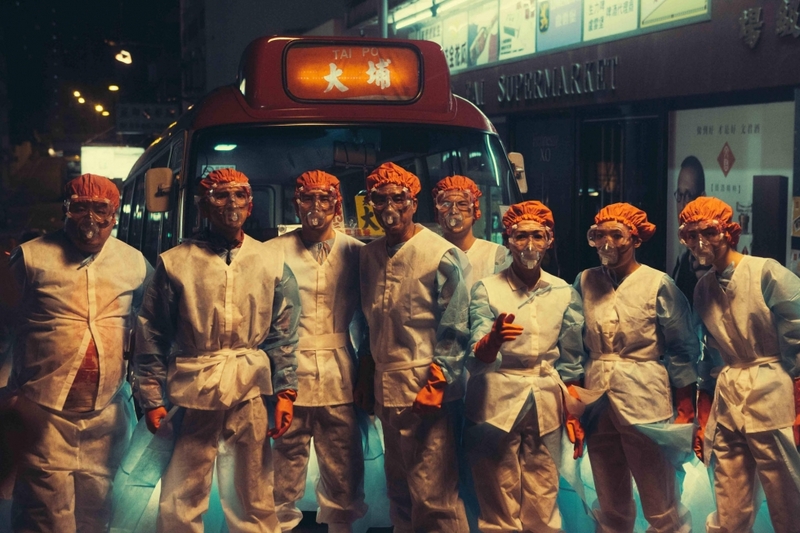 Chosen by festival programmers Sarah Perks and Andy Willis, both HK cinema fans, it proved to be the ‘popular cinema with a message’ that doesn’t usually get onto UK cinema screens. The Midnight After is an adaptation (loosely, I imagine) of an internet novel that went viral and was eventually published in print form. At first glance it looks like a conventional horror genre flic. A mini-bus driver is called from his mahjong game as a substitute driver for a late-night service starting in Kowloon and heading out to Tai Po in the New Territories. The passengers are a motley crew of students, young couples and older eccentrics. Part way through the Lion tunnel something happens and the bus arrives in a deserted and apparently post-apocalyptic Tai Po. Panic gradually sets in, some members of the group break away and die in mysterious circumstances. We’ve seen it all before but Chan’s track record suggests that the usual conventions won’t deliver the usual outcomes or the usual pleasures. I’m not going to pretend that I knew what was going on for much of the film and I certainly didn’t ‘get’ the ending – just like everyone else. I can also understand the complaints that the film is too long (123 mins is pushing it for this kind of production) but overall I enjoyed the experience. Chan’s 1997 film was one of the last of the films exploring life for youths in Hong Kong during the final months of control from London before the ‘handover’ to China. It doesn’t take too much imagination to work out that the passengers on the minibus (and the driver) are representative of certain groups in Hong Kong society and that trying to organise themselves into a group in order to survive – and to try to understand what is happening – is a metaphor for ordinary HK residents trying to deal with the Chines authorities. On the other hand, they also behave a bit like the marooned schoolboys in Lord of the Flies and the folk getting together to fight zombies in Romero’s Living Dead films. Chan gives us some good laughs between the blood and gore and other effects. A highlight is a decoded message referring to David Bowie’s hit ‘Space Oddity’. Another reference is to the Fukushima nuclear disaster. The ending of the film seems like it is deliberately set up for a sequel. (In fact the whole narrative feels like an extended episode or episodes of Dr Who.) The film was successful in its home market where the actors, the dialects and cultural references – as well as the political implications – make most sense. I wonder if it might also do well in other parts of East Asia. At times it reminded me of Korean and Japanese films. One website informs us that Chan released a second version of the film cut to be screened to under-18s and an obvious ploy to expand the audience. The Midnight After made HK$10 million after just 6 days on release and Chan has said that he will definitely make a sequel if the box office passes HK$30 million. To put this in perspective, the target is the equivalent of just under US$4 million. Still, this is a significant amount for a domestic HK film these days. I hope the director gets his wish. I’m just glad to have seen an enjoyable comedy-horror in ‘Scope. Hong Kong popular cinema is discussed in both Chapter 2 and Chapter 11 in The Global Film Book. The idea of developing an internet novel into a film is explored in Chapter 2 in terms of the smash hit South Korean romantic comedy My Sassy Girl (2001). This entry was posted in Chinese Cinema, Comedies, Horror and tagged Fruit Chan, Hong Kong cinema, metaphor, science fiction. Bookmark the permalink.